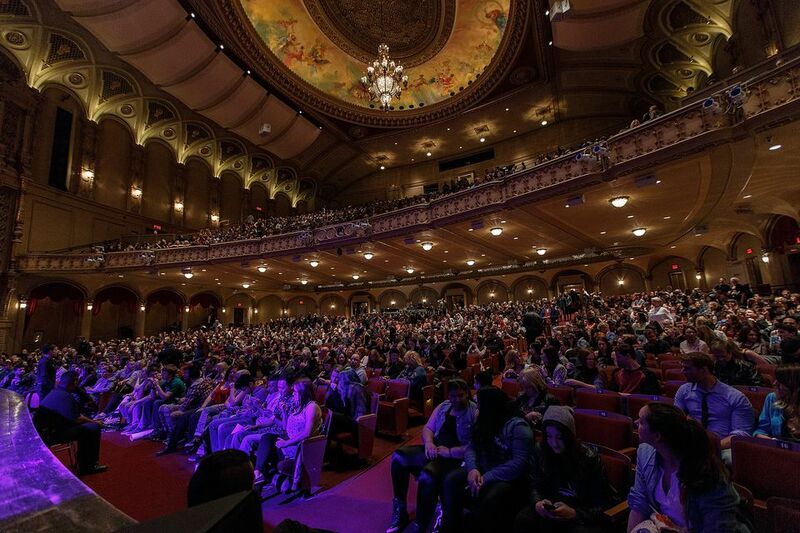 Vancouver might not be as well known for its cultural scene as Toronto and Montreal but the smaller city still has its fair share of excellent theaters, from ornate historical spaces to cozy and quirky stages. Performances range from avant-garde, artist-driven shows to big-name Broadway musicals and classic theatrical productions. On a rainy night in Vancouver, of which there are many, the city's theaters are a popular place to enjoy a show. In the summer the al fresco Bard on the Beach comes to Kitsilano for a season of Shakespeare plays but if you're visiting any other time of year, here are 10 of the best theaters in Vancouver, BC. In the heart of Vancouver’s Entertainment District on Granville Street, the Orpheum has been a musical and theater venue since the 1920s. It opened in 1927 and the interior still showcases sweeping staircases, antique decor, and a domed auditorium that features an ornate ceiling mural and giant crystal chandelier. Home to the internationally renowned Vancouver Symphony Orchestra – the largest performing arts organization in Western Canada – the Orpheum also hosts city choirs and performing artists from around the world. Host to most of the city’s ‘big name’ shows, Queen Elizabeth Theatre often showcases Broadway shows, opera, ballet, and musical performances, as well as a locally curated art gallery exhibiting works by emerging artists. The regal-sounding theater is named for its most famous patron, Queen Elizabeth II, who attended a concert here in July 1959 when the theater first opened. Inside, the decor is classic and contemporary with sweeping staircases and dramatic chandeliers combined with deep crimson seating and an airy auditorium. Cozy yet classy, the Vancouver Playhouse’s intimate theater makes it a favorite for dance, film and theater performances that are acoustically driven performances such as chamber music and spoken theatre. Popular performers include international dance acts via DanceHouse; Friends of Chamber Music, one of the city’s longest-running performing arts organizations; and the Vancouver Recital Society, which presents award-winning artists alongside emerging talent. Since 1973, The Cultch (originally called the Vancouver East Cultural Centre), has been a hub for innovative theater and diverse arts events in Vancouver. Housed in what was once an abandoned church, the space was renovated in 2008 to create a state-of-the-art theatre and the new Vancity Culture Lab, but the Historic Theatre balcony still remains. The original church was built in 1909 and it was used as a place of worship until the late 1960s when the city took it over - in 1973 it became the Vancouver East Cultural Centre and soon earned its nickname, The Cultch. Showcasing local, national, and international performances in contemporary dance, music, theatre, and visual arts, The Cultch showcases cutting-edge performances from all over the globe. Thought to be one of Vancouver’s oldest standing performance venues, the York Theatre was built in 1913 and opened as the Alcazar Theatre. Over the years it was known as The Palace, Little Theatre, York Theatre, and even Raja Theatre when it operated as a Bollywood film cinema. In 2008, the heritage building was saved from demolition and it was restored and reopened in 2013 with a performance of East Van Panto (now a local tradition every Christmas time). It is now run by The Cultch and it showcases artists and community groups that have rented the space. Next door to the historic Orpheum, the appropriately named Annex is the sassy little sister of the ornate finery next door and is home to a cabaret-style venue, complete with red curtains and two floors of performance space. Head here for eclectic shows from music festivals to modern dance theatre. Western Canada’s largest theatre company has three venues: the 650-seat Stanley Industrial Alliance Stage, 440-seat Granville Island Stage, and 250-seat Goldcorp Stage at the BMO Theatre Centre. Founded in 1958 as a private club for musicians, actors, and artists, the first Arts Club Theatre opened in 1964 in a converted gospel hall at Seymour Street and Davie. During its 27 years of operation, the 250-seat stage helped launch the careers of Canadian talents such as Michael J. Fox. Granville Island Stage opened in 1979, with the other two opening in 1998 and 2015, showcasing everything from comedy plays to Broadway musicals, classic London theatre, and acclaimed productions from around the world. Opened in 2018, this newly renovated performance venue is located above the historic Penthouse Nightclub. Previously, these upstairs rooms hosted exclusive parties and performances by music legends like Louis Armstrong, Ella Fitzgerald, Sammy Davis Jr, and Frank Sinatra. Now the new studio theater hosts low-key, intimate shows performed by Seven Tyrants Theatre Company — a Vancouver-based indie theater company that had been performing for a decade before opening the new space. Since 1982, Gateway Theatre has been hosting theater and dance performances, funded by the City of Richmond to create a cultural space for Vancouver’s neighboring city. The modern theater is comprised of a 522-seat Main Stage and an 89-seat studio where more avant-garde plays are performed. Located in a heritage fire station that was built in 1906, the Firehall Arts Centre is known for its innovative, eclectic and often politically-charged plays, as well as cutting-edge dance performances and visual arts exhibitions. The arts center also showcases performances from other performing arts organizations, as well as local and national artists.